The Yezidis celebrate their New Year, Sera Sal i.e. the Head of the Year, with great fanfare. Sera Sal falls on Wednesday in the month of April and is also known as Red Wednesday. This commemorates the day when Tausi Malek, the Peacock Angel, came to Earth for the first time, millions of years ago. Tausi Malek calmed the planet earth by spreading his peacock wings of rainbow colors and blessed the entire world. 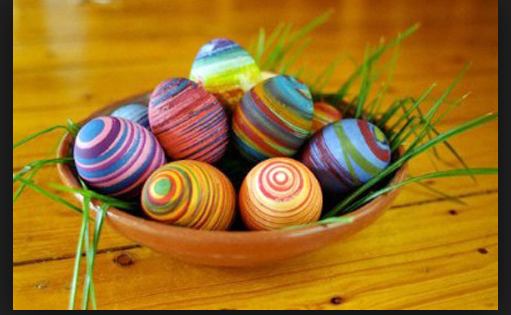 One of the key feature of Yezidi New Year celebration is the coloring of eggs, a tradition that can be traced back to ancient Sumerian and Babylonian celebration of spring festival of Ishtar. These colored eggs are the symbolic representation of Tausi Malek’s rainbow colors that he is believed to have used for blessing the earth with fertility, hence, the rebirth of the spring season. The eggs are painted red, blue, green, and yellow. The womenfolk’s decorate their homes by placing red flowers and colored egg shells on top of their front doors so that Tausi Malek can recognize their abode for the blessings. The Yezidi calendar is dated to be 6764 years old, therefore, it has its origin about 4764 years before the arrival of Christianity and more than 5000 years before the arrival of Islam. On this particular day, at dawn, women dress up in colorful clothing’s and go to the nearby cemeteries with pots of dishes, candies, lamps and other offerings for the dead and fairies which are said to return to earth on Sere Sal. These offerings include oranges, apples, dates, colored eggs etc. The graves gets transformed into banquets for the spirits that return to their graves, and the offerings are made. Women take to singing and dancing with dehol (drum) and zorna (shawm). Table clothes are spread around on the ground in between the graves and women proceed to feast upon variety of offerings. Also, Red flowers are plastered on doors so the Peacock angel could recognize his people. 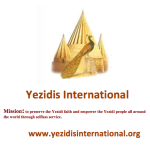 The color red represents sacrifice which is demanded of all Yezidis. At Lalish, the place where the holy temple for the Yezidis are located, a bonfire is lit to welcome Tausi Melek. The fire is the divine source of God and Sun. Eggs are boiled to represent how earth was liquid and then got solidified with the coming of Lalish. Marriage is forbidden during the month of April while the earth springs to life. Also forgiveness take place at this time. Many who have been enemies reconcile with mediation by a priest or friend for the sake of the New Year.